Michael Abushakra is the son of a 1st generation immigrant from Jerusalem. His journey with jewelry began in the retail section of the business offering pre-made pieces to customers at his father’s store. After working in the industry for some time, Michael had the vision to do more. He realized in order to continue in the business he would need additional, specialized training to become more than just a sales associate. Michael went to the Gemological Institute of America, where he received their highest level of jeweler certification. During his time at GIA, he discovered his passion for the jewelry arts. Michael loves the artistic expression found in metalwork because it gives him the opportunity to create artistically, one of a kind pieces. After Michael’s completion at GIA, he worked for a large national jewelry chain. Along the way, he realized the industry was filled with performance and sales goals instead of passion and care for people. It was in that moment that Michael knew that the corporate jewelry business was not the avenue for him. He was fortunate to find some great mentors inside and outside the jewelry business that helped him discover how to be successful. These experiences and lessons all led him to where he is today, owner of Brynn Elizabeth Jewelers, Inc.
Michael is constantly pursuing and continuing education in order to be as knowledgeable as possible to help correctly guide people with every question and to operate with a level of integrity that would not have been possible in a corporate jewelry environment. Self-employment allows his intuition about people to guide his decisions without focusing on numbers and statistics. One of the most special and rewarding aspects of his craft is the opportunity to rework a family heirloom or take an antique gemstone and create the perfect custom piece by learning about that person. He takes pride in correctly interpreting a person’s desires and creating a piece of wearable art. There’s no greater reward for him than preserving the sentimental attachment to an antique piece and seeing the customers joy, often expressed through tears, when they come to pick up. Michael never takes these opportunities lightly and hopes to never lose appreciation for life and stories behind each piece of jewelry! Savannah Idol was born and raised in Kernersville, NC. She has always expressed a strong interest in rocks, minerals, gems and the way the world has evolved. As a child, she found herself collecting minerals and constantly contemplating on how the minerals progressed into such a simplistic form of beauty. Over time it became evident that our world consists of a variety of elegant structures that can be worn aesthetically to represent love, fashion, and commemoration. It all began during the summer of 2015. Savannah was completing her final year at Appalachian State University when she was introduced to Michael Abushakra, the owner of Brynn Elizabeth Jewelers, Inc. Savannah was majoring in Geology and found the field of Gemology very interesting. Soon after their introduction, Michael offered her an opportunity to observe the daily tasks required of a gemologist and jeweler. She had always had an artistic mind, but found it difficult to connect her love of gems and art. It was within those few weeks that she had found her calling. Savannah graduated from Appalachian State University (ASU) in May of 2016 with a Bachelor of Science degree in Geology. 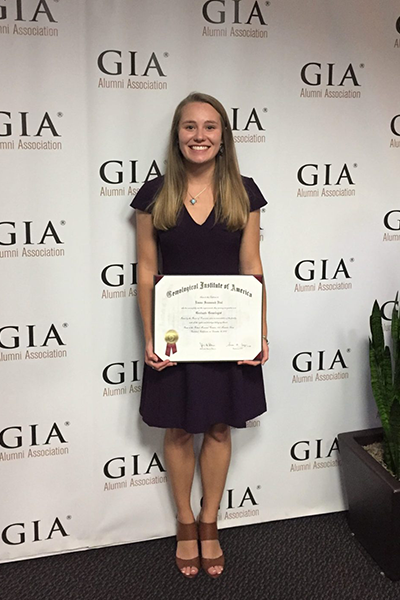 Her personal interest and desire to continue her education streamlined into a new goal of attending the Gemological Institute of America (GIA), located in Carlsbad, California. GIA is a nonprofit institute that is dedicated to the education and research of multiple fields such as: gemology and jewelry arts. In December of 2016, after a lot of hard work and determination, Savannah graduated from GIA with her Graduate Gemologist diploma. Savannah relocated to Ocean Isle Beach in January 2017 and has since been the jewelry/gem appraiser, as well as, a designer at Brynn Elizabeth Jewelers, Inc. Gemology gives Savannah the opportunity to combine a beloved hobby with the ability to bring joy to various individuals. Savannah wants every client to feel welcomed when they walk into Brynn Elizabeth Jewelers, Inc. She also wants each client to feel like they have learned something new while being in the store. Gemology is fascinating in the sense that it is a field of continuous growth and there is always something new to discuss if interested. Tyson Lucas was born and raised in Marietta, Ohio. At the age of 21, he received an apprenticeship opportunity with a well-respected jeweler in Alabama, which is where his journey began. Tyson moved to Alabama and for three years he absorbed all the knowledge and skills necessary to pursue his aspired career of becoming a jeweler. 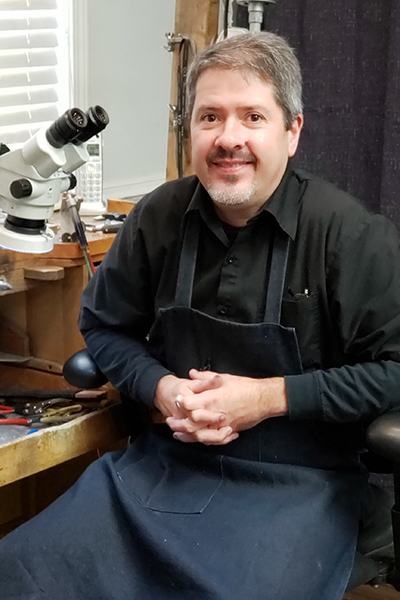 As any jeweler would, he started with the basics and as time progressed, he became more than prepared to take the next step in his career. After much consideration he decided to move to North Carolina to work for a high-volume repair shop. Little did he know that is where he would stay for the next 26 years. The beginning of 2019 marked 27 years of experience for Tyson and he is shooting for many more. 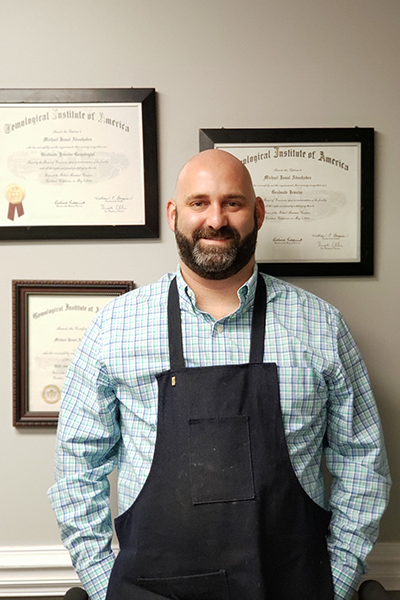 In the middle of 2018, Tyson joined the Brynn Elizabeth Jewelers, Inc. family where he is one of two on site jewelers. He loves every opportunity he is given, and he takes pride in giving client’s honest information regarding their jewelry. His love for the jewelry arts continues to grow with each job he completes. During his free time, he likes to work on cars, fish, and most importantly spend time with his family.